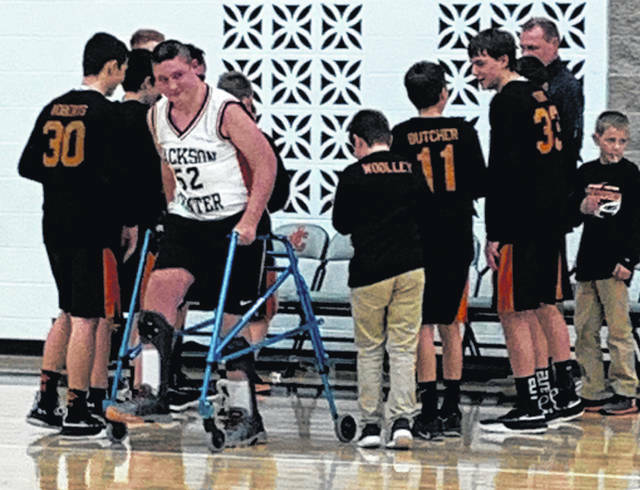 Landon Reese, in white, with teammates during the Jackson Center Tigers’ final regular season basketball game of his eighth-grade year on Jan. 28. Reese was seriously injured after he was kicked in the head by a horse in 2012 and regularly works to recover from the incident. He was given the opportunity to start for his team against the Fairlawn Jets. In June of 2012, Landon Reese was at a family camp-out when a horse kicked and struck Landon in the head. He was CareFlighted to Dayton Children’s Hospital where he spent eight weeks, followed by an additional eight weeks at the Cleveland Clinic Children’s Rehabilitation Hospital. An injury from which many do not recover, Landon not only survived, but he thrives, and Landon works daily to regain abilities that he lost as a result of the accident. Throughout Landon’s recovery he has remained very involved in sports. He participates in baseball and basketball, and even though he cannot physically go out on the field or court, he is there every day at practice and games to watch and cheer on his teammates. Landon has never lost his competitive edge, and he absolutely loves the Jackson Center Tigers. The words that are constantly a mantra to him are, “Do whatever you can do every day to make your team better.” He takes these words to heart and gives his all daily. On Jan. 28 in the final regular season game of his eighth grade year, all of Landon’s hard work paid off. Landon was given the opportunity to start for his team against the Fairlawn Jets. Through much planning and cooperation from his coaches and the opposing team, Landon walked through the tunnel to a standing ovation, giving his teammates high-fives with a smile that lit up the room. The jumpball went up, the Tigers controlled the tip, and with Landon standing at his post position, his cousin came down, bounced the ball off Landon’s chest, and went in for a layup, giving Landon his first ever statistic; one that will be remembered forever! I want to thank all those involved in the planning of this special night, from the coaches who planned this event to Fairlawn’s junior high basketball team, for they reminded us all what sportsmanship is about. In many of Ohio small towns, we take sports very seriously. And sometimes maybe a little too seriously, but at the end of the day the event that took place in the Jackson Center gymnasium shows the positive aspect of sports, sportsmanship, and giving kids an opportunity. Anyone who watched that game and saw the smile on Landon’s face witnessed true sportsmanship. Thank you to all who have supported Landon throughout the years, but I would like to extend a special thank you to those in attendance, Landon’s coaches, his teammates, and the Fairlawn team and community.